The Belgian government, on 13 September 2003, committed itself to contribute CHF 3,080,000 (2 million euro) over 4 years — 2004 to 2007 — to the WTO Doha Development Agenda Global Trust Fund. 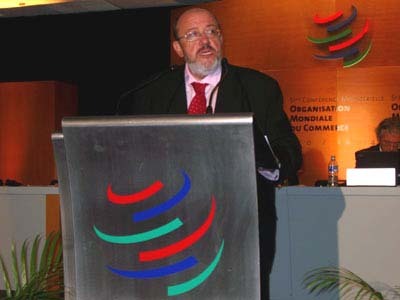 The Belgian Minister for Foreign Affairs, Louis Michel, announced the donation during his speech at the fifth WTO Ministerial Conference in Cancún. “Thanks to generous donations such as Belgium's, we have been able to significantly increase the WTO's technical assistance activities. This is helping developing countries participate more actively in the WTO negotiations,” said WTO Director-General Dr. Supachai Panitchpakdi. This contribution is in addition to several donations Belgium has made to the Doha Trust Fund. In 2003, the Belgian government contributed CHF 752,000 (500,000 euro) and the Government of Flanders – federated entity of Belgium – granted an additional CHF 231,000 (150,000 euro). In 2002, the Government of Flanders also contributed CHF 154,000 (100,000 euro). The Doha Development Agenda Global Trust Fund was set up following the WTO Ministerial Conference in Doha in November 2001 which launched a new round of negotiations. In December 2002, the General Council approved a target amount of 24 million Swiss francs for the Doha Trust Fund for 2003.